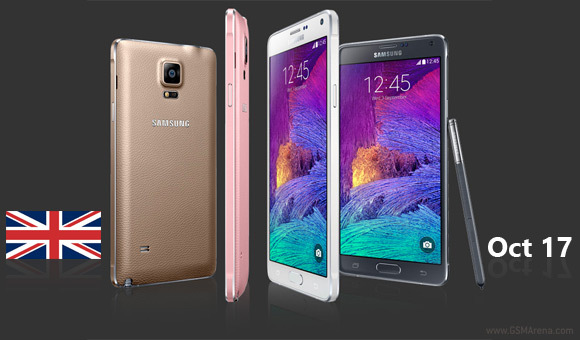 The Samsung Galaxy Note 4 was supposed to hit the shelves in the UK tomorrow but there is going to be a small delay. An eager Twitter users asked Samsung Mobile about the launch who confirmed that the flagship phablet will be available a week later than originally planned. The timeline map released by Samsung a week ago put the UK among the countries where the Galaxy Note 4 will be available on October 10. That was for Samsung's own stores though, pre-orders for on-contract devices listed October 17 as the shipping date. A good part of Europe will also get the phablet at that date and now it seems so will the UK. Samsung is citing "amazing interest and demand" as the reason for the delay. The Samsung Galaxy Note 4 costs around £575 off contract but can be head for free with a contract worth at least £38 a month.